I said something the morning that I made these crepes that I thought I would never hear myself say. I said, "I am so glad that I have Celiac because I finally have been able to cook with the grains and flours that I have always wanted to but was too lazy to learn how to use them". SHOCK! Why would I ever say that? I did say it and I truly meant it. Years ago before I started having health issues I would research all types of information about cooking with Teff, Amaranth, Millet and Almond Meal, just to name a few. I wanted to explore and try new things. It seemed like something always got in the way though. So I learned to cook with white flour and then slowly turned to whole wheat. Well we know how that turned out for me..ha ha ha. Great actually! I feel wonderful and I finally get to use all of those flours that I studied years ago and it makes me smile. The flavors, the texture and pure science of trying to make it work, is exciting to me. I never know what I will end up with if I try something new and alter a recipe. It's challenging. I love that! I get to think outside the box and be creative. This is wonderful. The recipes that I have converted and have had success we usually end up liking them more than the original. The flavors are so much more intense. Using these types of flours and starches is not limiting only to those with health and allergy issues. Everyone should try using them especially if you are trying to eat healthier. Many of the different types of flours have a tremendous amount of nutrition. Several of the grains are still in their pure form from thousands of years ago, they have not been changed or manipulated. I really enjoy the fact that it connects me to other parts of the world. Some countries don't use wheat because they don't have access to it but they still eat bread, pasta and flat breads. It's okay to cook with what you know but on occasion it's fun to try new stuff and recipes. More and more people, family and friends are having issues with allergies and intolerances. I have said this before and I will say it again, I am always touched when a friend goes out of their way to make me something special that is gluten free. Is it hard? It's different. Will I have failures? Yes, I still do. I have more success than failures the more I study and cook. Does it taste the same? Some things do and some things taste better. I have attached two links to sites that helped me in this adventure of cooking with new flours and starches. they are listed below. There are thousands of sites to visit and so many new and easy foods to help you have success with "cooking outside the box". Whole Foods is a great resource for learning about different grains and flours. Click here and you will be directed to a directory with the types listed and wonderful explanations of each flour and it's attributes. Gluten Free Goddess is one of my favorite blogs to visit. She has tons of information about cooking and substituting with all types of flours. You can find a direct link to her blog about this here. 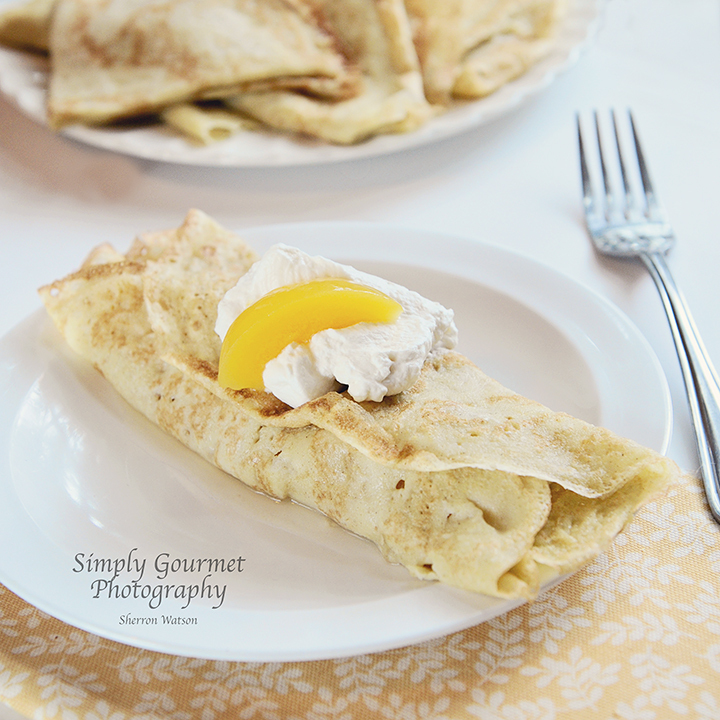 This recipe is from "JOY of COOKING" and it is the best Crepe recipe I know of. 1. Combine all ingredients in a blender or high speed blender, like a Vitamix. 2. Cover with plastic wrap and let stand for 30 minutes or in refrigerate for up to 2 days. (This allows the flour to thoroughly absorb the liquid and gives the gluten in the flour a chance to relax.). 3. 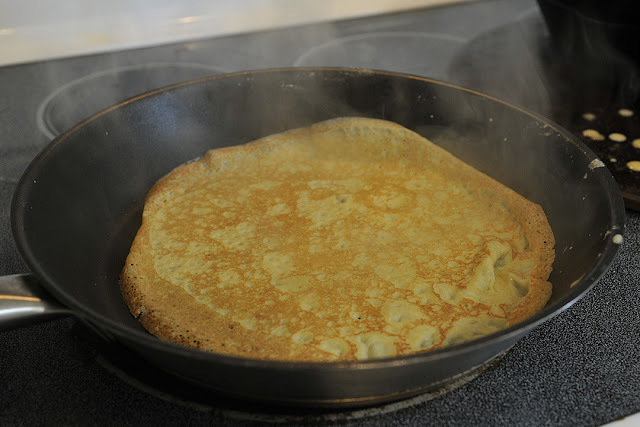 Place a nonstick or seasoned crepe pan over medium heat. Coat the pan with a little unsalted butter. 4. Stir the batter and pour about 2 tablespoons into the pan, lifting the pan off the heat and tilting and rotating it so that the batter forms an even, very thin layer. Cook until the top is set and the underside is golden. 5. Turn the crepe over, using a spatula or your fingers (fingers work best here) and cook until the second side is lightly browned. 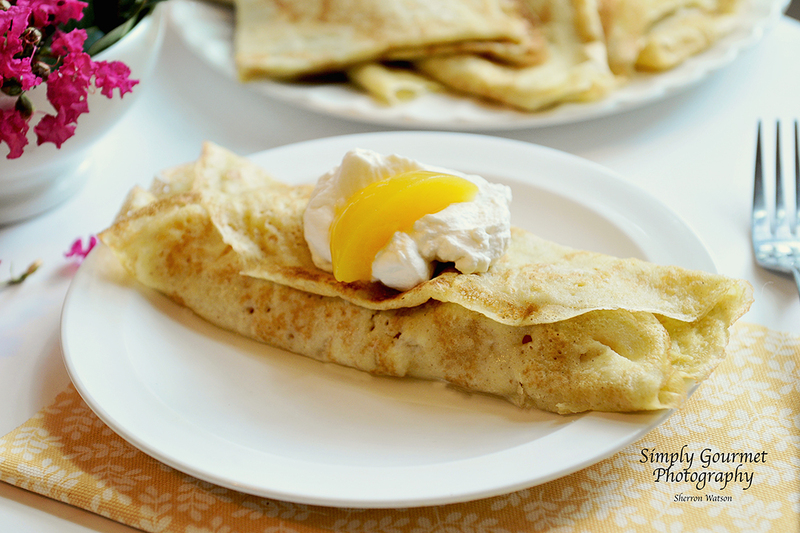 Remove the crepe to a piece of wax paper. 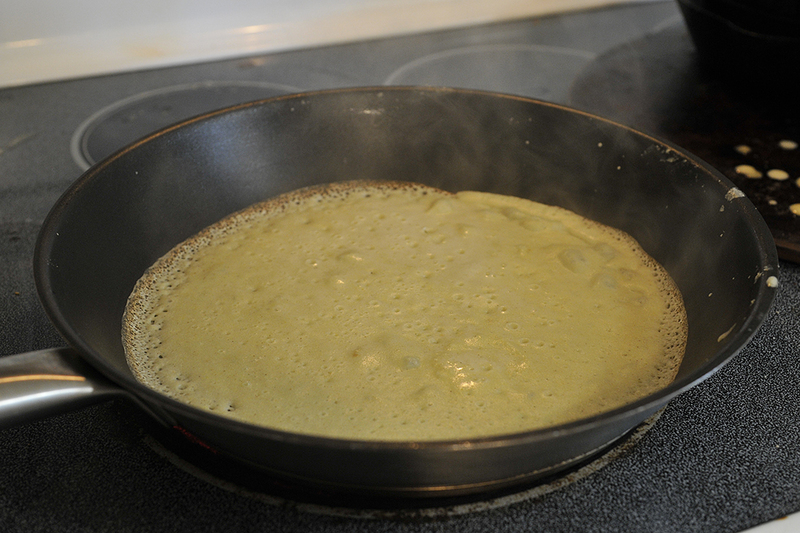 Continue cooking the rest of the crepes, buttering the pan and stirring the batter before starting each one. This is the gluten free crepe. You can see how it holds it shape and is easily turned with a rubber spatula. 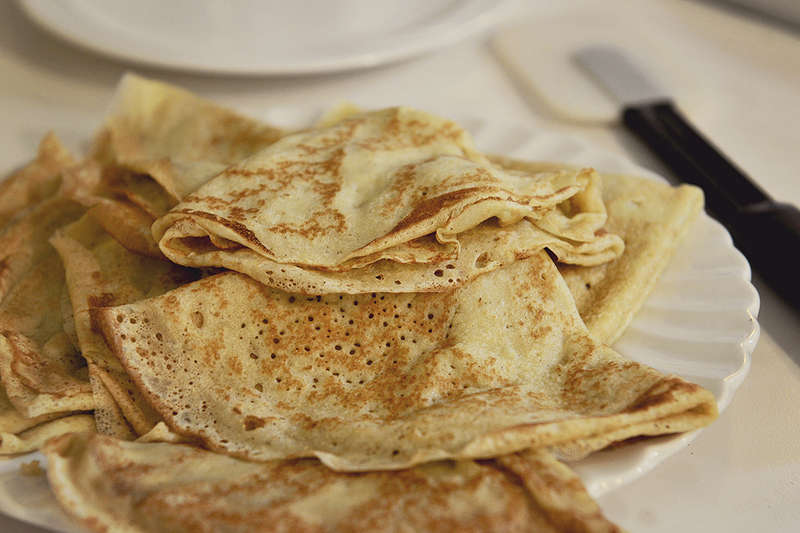 Stack the finished crepes between sheets of wax paper. Use immediately or let cool, wrap airtight and freeze for up to 1 month. 1. Combine all ingredients in a blender or a high speed blender, like a Vitamix. Cover and let set for 30 minutes on the counter top. 2. Place a nonstick or seasoned crepe pan over medium heat. If using butter to coat the pan, use very little or none at all. When I make mine, I don't use anything. I find that it does not cook the batter the same, it makes it too soft to flip. It's not uncommon for the first one to not turn out. 3. Stir the batter and pour about 2 tablespoons into the pan, lifting the pan off the heat and tilting and rotating it so that the batter forms an even, very thin layer. Cook until the top is set and the underside is golden. 4. Turn the crepe over, using a spatula or your fingers (fingers work best here) and cook until the second side is lightly browned. Remove the crepe to a piece of wax paper. Continue cooking the rest of the crepes. 5. 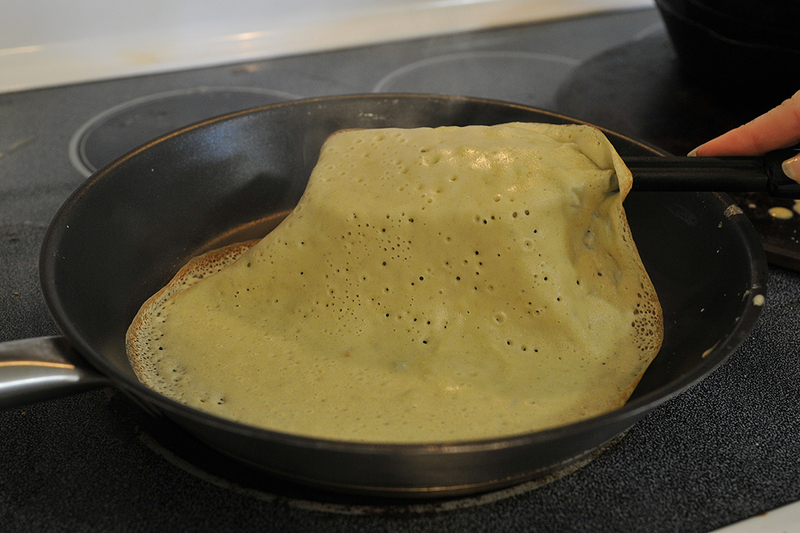 Before I take the crepe out of the pan, I fold it into a triangle and stack them on a plate. Stack the finished, unused crepes between sheets of wax paper and store in the fridge in an air tight container. When you are ready to reheat the crepe, do not unfold. Reheat in the shape of the triangle and then unfold the crepe and add your filling. Reheat if necessary. They both look lovely! Looking forward to trying them. FYI, I found you through Recipes for My Boys' linky party.